Best Chinese Knives: Maxace Red Queen Review - The Queen of Mean! Maxace Red Queen Review - The Queen of Mean! I got this knife over a year ago and am now ready to do a review on it. The reason it took so long is because I haven't used it much during this period of time and I'll explain why during this review (in the Cons section). The knife came in a branded black presentation box. Was sharp out of the box and had no issues at all with centering, lockup and action (very smooth out of the box). - The quality out of the box. Fit, finish, lockup, centering - all close to perfection. 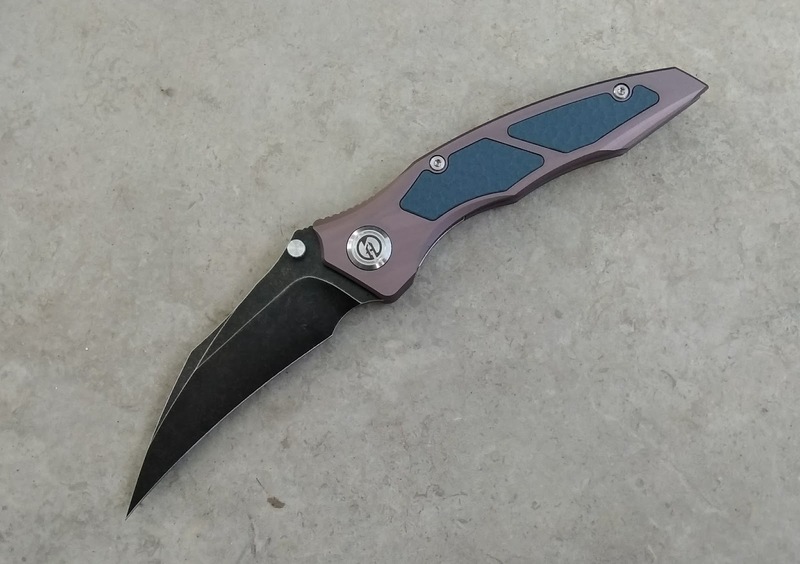 - The materials - anodized aluminum handles + backspacer, nested steel liners, G10 inlays, bearings in the pivot and blackwashed 10Cr15CoMoV blade (which is like 8Cr13 on steroids with added Carbon and Cobalt). - Great ergonomics that will fit most hand sizes + awesome added gimping and finger choil. - Options - this knife comes in 6 color options (3 colors of handles and inlays and blackwashed/stonewashed blade). Options are always great.- Very smooth action and deployment (added fidgeting factor). - Very budget price point for what you are getting. - Definitely the design. The looks, the tactile feel, the locking method (hidden blade stops), the sound of deployment, even the hardware - all make it feel like a much higher end knife than the price it sells for. The looks are also very charismatic - the knife looks mean (with that hawkbill blade and very sharp pointy tip) and reminds of an antagonist in a book or a movie, which is actually awesome and really cool. 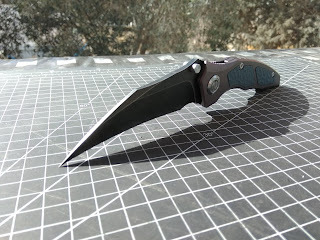 - The knife is quite hefty (has non skeletonized liners) but the balance is right where it is supposed to be (under the finger groove), so feels much lighter than it is. - The steel pocket clip is quite low and stiff. Although it doesn't interfere with the ergos and is usable it is quite complicated to put on the pocket. Taking out is much easier and works fine that way. - The hawkbill blade - cool as hell, but other than self defence (which I do not support) and opening packages - this knife has almost no other practical use. I mean you could slice with it, but it is quite uncomfortable in comparison to other blades I have. I like this knife a lot. Although I didn't get much slicing use out of it - I still enjoy very much to own it and use it for what is possible (like opening packages and letters). I'm sure it is suitable for self defence, but I don't practice that (self defence with a knife). The quality, the design, the looks, the materials and the charisma - all are definitely there and like I stated - I'm happy it is part of my collection.